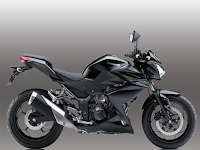 Kawasaki Z250 Specification - The presence of Kawasaki Z250 further enliven the market 250cc sport bike. The model of Street Fighter increasingly making Kawasaki Z250 more robust and fierce. 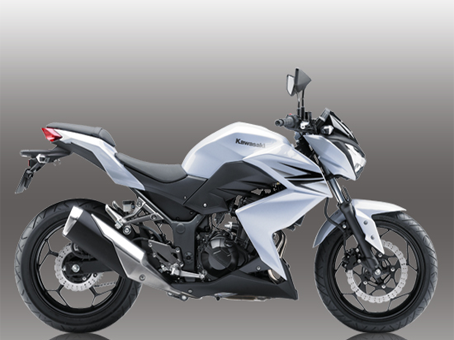 Inspired by the street-fighter image of its Z Series brethren, the Z250 also features a “mass-forward, minimalist-tail” design. Its muscular, athletic bodywork hints at the bike’s performance, while accentuating the engine and curved exhaust headers. 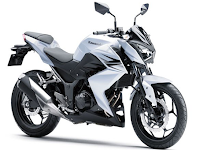 Aggressive-looking whether on the move or standing still, the Z250 has a big-bike presence and an instantly recognisable silhouette that says, at-a-glance, that this is no ordinary “naked” bike. The Z250 retains the nimble handling character of the Ninja 250, but a more upright riding position and wider handlebar put the rider in the ideal position for active control, facilitating dynamic, sporty riding and easy manoeuvrability. 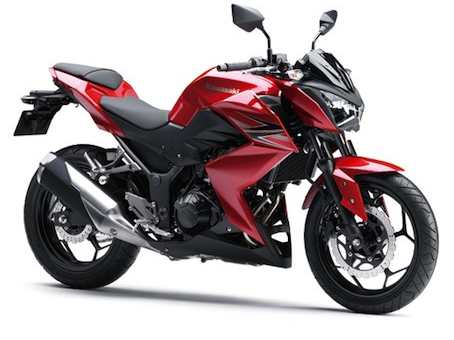 Backed by Ninja-based engine and chassis performance, the skilled Z250 rider will be untouchable in an urban setting. Compact headlamp cowl with mini meter visor is one of the key styling elements of the Z250’s aggressive design. Multi-reflector headlamp from the Z800 reinforces the strong family resemblance. Adding to the aggressive street-fighter design, the fuel tank is flared at the top edges and slants forward. The flared design enables a large 17 litre fuel capacity. Cruising range is on par with large-displacement models. Another key Z styling feature, muscular shrouds contribute to Z250’s imposing presence while helping to set it apart from the relatively bland-looking naked bikes available until now. Seamlessly integrated with the engine shrouds, the sharp under-cowl contributes to the aggressive street-fighter design. Flat bend of the wide handlebar is another element contributing to the strong street-fighter image. The wide upright position lets the rider see ahead when navigating city traffic, and also makes it easy to put input into the ’bars for dynamic, sporty riding. Blacked-out colour adds to the aggressive image. Short-style muffler, minimalist tail cowl and wider rear tyre give the rear of the bike an aggressive, racy look. 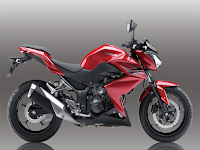 Slim and sharp looking tail cowl design contributes to the Z250’s aggressive mass-forward image. Unitised inner fender and chain cover contribute to the street-fighter design. Rear turn signals have a sharp new design. Both front and rear turn signals use clear lenses for a high-quality look. Sporty instrument panel design contributes to the Z250’s advanced-technology and high-quality image. Large, analogue-style tachometer offers easily legibility and great looks. Multi-function LCD screen functions include: speedometer, clock, fuel gauge, dual trip meters, odometer and economical Riding Indicator. The Economical Riding Indicator appears on the LCD screen to indicate favourable fuel consumption. With its slightly forward-slanting seat and wide, raised handlebar, the Z250 ergonomics were selected to accommodate a wide range of riders. The natural, relaxed upright riding position is ideal for sport riding or riding with a passenger, in the city or on the highway. Relatively flat angle of the rear frame keeps the seat height to a low 785 mm. This makes it very easy for riders to reach the ground with their feet. Front seat is narrower near the tank (between the rider’s thighs), facilitating an easy reach to the ground, and making the bike easier to control when manoeuvring for parking, etc. Supersport-style aluminium footpegs give a more direct feel and good controllability when sport riding, compared with rubber-covered pegs. Compared with a single-cylinder engine, Kawasaki’s liquid-cooled, DOHC, 8-valve Parallel Twin delivers smoother, more responsive power at low and medium rpm, and harder hitting power at high rpm. The 180% crankshaft design contributes to an engine character that likes to rev and keeps on pulling at high rpm. With power that exceeds its class, and a balancer and partial rubber mounting to help dampen engine vibrations, the Z250 offers a very smooth ride feel as well as comfortable cruising. Optimised compression ratio (11.3:1) contributes to the Z250’s robust engine character. Sleeveless, aluminium die-cast cylinder features plated bores. The cylinder features an open-deck design, offering excellent heat dissipation and light weight. The main throttle valves are 28 mm in diameter, but sub-throttle valves measure 40.2 mm to help flow a greater volume of air, which allows the engine to pull strongly right to the rev limit. Fine-atomising injectors with a droplet size of only 60 μm contribute to combustion efficiency. Compact injector bodies help minimise weight. Lightweight stick-type ignition coils help minimise electrical interference. 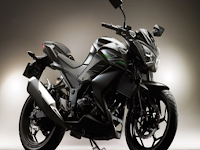 All Z250 models are fuel-injected. This ensures stable fuel delivery regardless of temperature or air pressure, as well as excellent starting characteristics. Similar to our Ninja supersport models, dual throttle valves give precise control of intake air, resulting in linear throttle response across the rpm range. 2-into-1 exhaust system, made of corrosion-resistant stainless steel, contributes to low- and mid-range performance and helps achieve the Z250’s smooth, step-free power curve. To achieve the optimal length, the header pipes are curved, contributing to the strong low-mid range torque. Likewise, the centre pipe curves to the left as it travels beneath the engine before returning to the right. Single honeycomb catalyser in the collector pipe ensures that Euro-3 emissions regulations are met. Short-style silencer with complex cross-section enables the requisite volume while ensuring an ample lean angle. Large silencer guard protects passengers from heat and also contributes to noise reduction. High Tensile Steel-tube diamond frame offers strength, longitudinal rigidity and high durability – both essential in a high-performance frame. Rubber mounts at the front of the engine (at the front of the cylinder head) significantly reduce engine vibration, contributing to the Z250’s high-quality ride feel as well as rider comfort. 37 mm telescopic fork has balanced settings that realise both good ride comfort on bumpy city streets and a firm feel when sport riding. Complementing the stiffness of the frame, supple action (particularly initial to mid-stroke) results in very smooth and stable handling. Kawasaki’s original, linkage-equipped Uni-Trak rear suspension delivers stable handling over a wide variety of road surfaces and speed ranges. Like the fork, the rear shock features settings chosen for comfort when city riding and a firm feel when cornering. 5-step preload adjustability lets riders adjust the stiffness and ride height to suit body weight or when riding two-up. Large-diameter 290 mm front petal disc brake operated by a 2-piston caliper delivers powerful braking and a natural feel at the lever. 220 mm rear petal disc and 2-piston caliper give dependable stopping power. • Petal brake discs like those on the Ninja supersport models offer excellent heat dissipation. Resin brake pads front and rear offer superior wear characteristics and superb controllability.